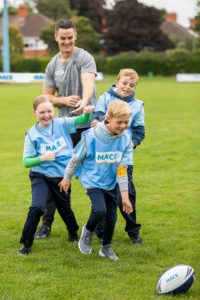 MACE, Ireland’s longest serving convenience brand in Ireland, has teamed up with Ireland and Lions superstar out-half Johnny Sexton to offer a once-in-a-lifetime opportunity of a coaching masterclass to one lucky school or club around Ireland. MACE stores are at the heart of the communities they serve and we want to encourage local children and their families to engage in a positive initiative for their local area. We are looking for local children to be proactive in their community and show that they are helping improve their community in a unique and innovative way. Daniel O’Connell, MACE Sales Director said, “We are very excited to have Johnny signed up to be the face of MACE for the next two years. It is a major coup for the MACE Brand and we are thrilled that our first initiative with him is a community one whereby we are encouraging local children to engage in some acts of kindness in their communities to be in with a chance to win a training master camp for their school or club with Johnny. The winning entry will win a training session for their local club or school with Johnny Sexton. This promotion is open to all primary schools and rugby clubs in the Republic of Ireland and entries can be made by an individual, or a group, who nominate either their primary school or local rugby club as the beneficiary of the prize*. Operated by independent retailers, MACE stores have been serving their local communities for more than 50 years, and with over 160 stores located around the country, the addition of Ireland’s most recognisable sportstar will help create further awareness and strengthen the brand as well as supporting local communities. *In order to win the prize your club/school must have suitable facilities to host the training master class with Johnny Sexton.